Check out these success stories of increasing fruit and vegetable intake across the Nation. Legal and policy approaches can be important tools for achieving healthier communities. 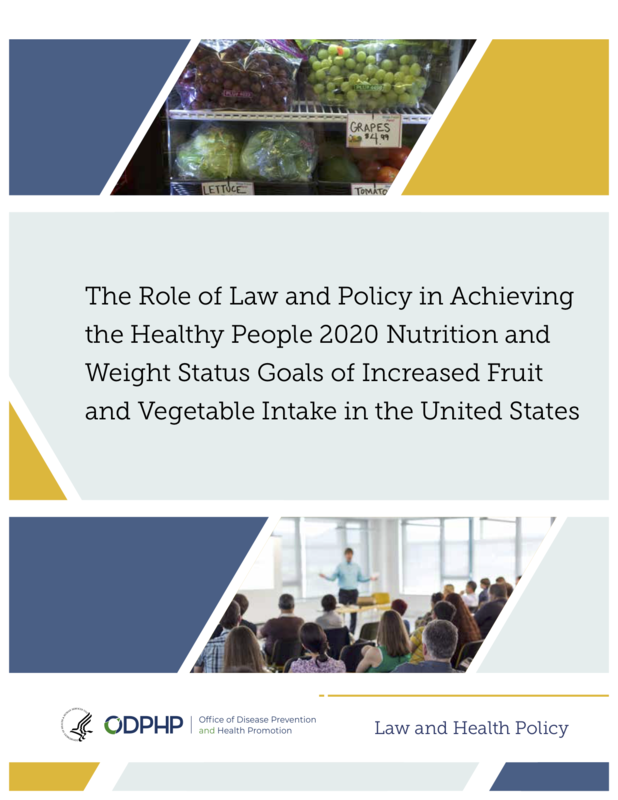 The report, The Role of Law and Policy in Achieving the Healthy People 2020 Nutrition and Weight Status Goals of Increased Fruit and Vegetable Intake in the United States, provides evidence-based information and identifies priority areas that can help communities achieve Healthy People 2020 objectives. This Bright Spot describes how the Navajo Nation helped their citizens access and consume more fruits and vegetables. The Navajo Nation covers 27,000 square miles, an area bigger than West Virginia. However, a 2014 report by the Diné Policy Institute found only 10 full-service grocery stores operating on the Navajo reservation, meaning that many people living there are more than 100 miles from a grocery store. Given the distance, many residents rely on gas stations and convenience stores, which sell mostly high calorie, heavily processed foods. It’s not only geography that impacts access to healthy foods—affordability is also a factor. “When we don’t have access to quality food and we’re forced to purchase non-quality foods, we’re really at a disadvantage,” says Gloria Begay of the Diné Community Advocacy Alliance (DCAA), a grassroots organization. Since 2011, DCAA has worked to change the Navajo Nation’s food environment and improve community health. In 2014, the Navajo Nation changed its tax policies to both encourage citizens to buy fresh fruits and vegetables (by reducing their relative cost) and discourage people from purchasing foods and beverages with “no-to-minimal nutritional value” (by increasing their relative cost). Specifically, Navajo Nation Legislation No. 0290-13 removed the 5% sales tax from fresh fruits, fresh vegetables, water, nuts, seeds, and nut butters.2 At the same time, the Healthy Diné Nation Act (HDNA) applied a 2% additional tax on sugar-sweetened beverages and foods that have been “stripped of essential nutrients” and are high in salt, saturated fat, and sugar.3 The Act applies to all retail purchases on the reservation, from families shopping at local trading posts to restaurants buying from distributors. For advocates seeking to advance similar policies, patience for ongoing negotiations will be key. DCAA first proposed the tax changes to the Tribal Council in 2011, but it wasn’t until 3 years later that HDNA was approved. Begay also points out that emphasizing the purpose of the intervention is key to gaining public support for such a change. Taking an approach that simultaneously incentivizes healthy foods, de-incentivizes foods with no-to-minimal nutritional value, and funds public health programs certainly offers a multifaceted opportunity for significantly improving the health and well-being of a community over time. Collaborations like the one between the Navajo Nation government and DCAA may inspire advocates in other locations to promote and improve fruit and vegetable consumption in a similar way.